We are extending our sale on optics, click here to check out the prices and get a new NIKON Scope or ULTRADOT sight for your AR. We are also cutting prices on all our Ultimate Bullet Button Tool magazine enhancements. We have 3 packs of MAGPUL and Ranger Plates for as low as $9.99. If you opted to keep your bullet button, these are a must have, Thordsen Customs original, you can't find anywhere else. See what's left & get them while supplies last. Last but not least we have a surplus of OD GREEN FRS-15 Basic Gen II Stocks (Buffer Tube Cover Not Included) click here to see our lowest price ever on the FRS-15. 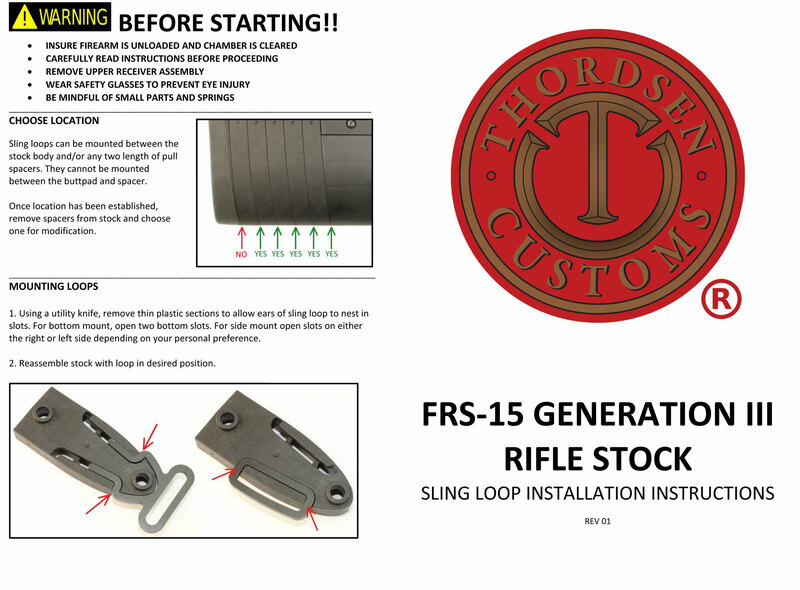 The GEN III FRS-15 Stock, like the AR-15 itself, is designed to be a modular platform that can accept an array of addons to suit the individual users needs and budget. Our four sling loop options are designed to be captured between any two length of pull spacers. This gives the user the flexibility to choose from a multitude of mounting positions and sling types. Whether you like side or bottom mount, you are right-handed or left-handed, or you like your sling forward or rearward, there's a solution. This product is intended for lawful purposes only. It is the responsibility of manufacturers, dealers, and end users to fully understand and adhere to Federal, State, and local laws when using this product. Thordsen Customs LLC and its industry partners will not be held liable for any unlawful configuration or other misuse of its products.